The cuisine of the Marche region is very rich in meats: sausages, braised roasts, prosciutto, lonzino, dried sausages and more! 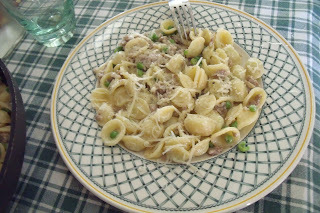 When I had my restaurant in Cagli, one of the favorites on the menu was Tortellini alla Montanara - Tortellini with sausage, mushrooms, peas and panna. 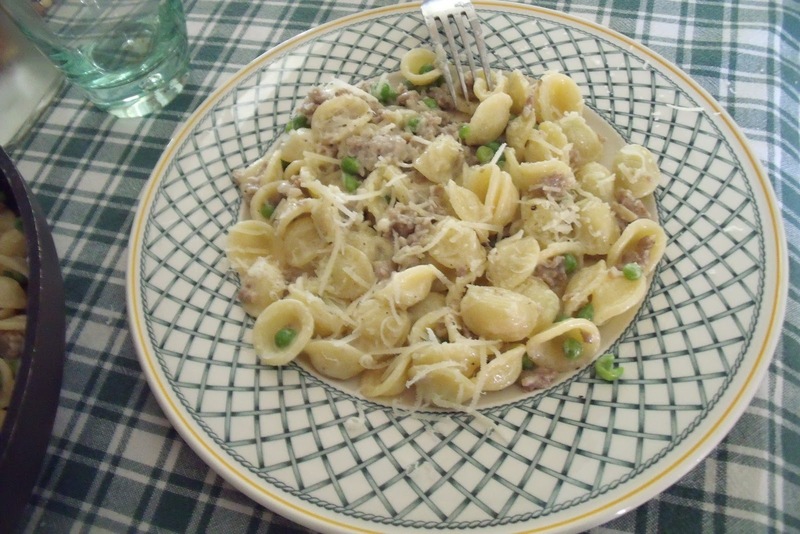 Another was "Penne alla Norcina" - pencil points with sausage, brandy and cream - an Umbrian speciality. Today I sort of brought them together and the result was delicious! 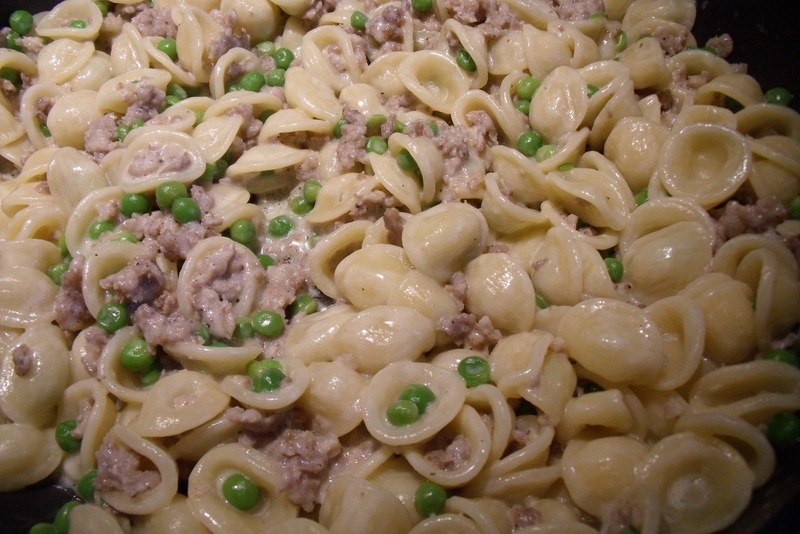 6 ounces of short pasta - I used orecchiette because that's what I had on hand. Remove the sausage from its casing and break it up in a non stick fry pan. Crumble it with a fork as it fries, let it get nice and browned but not crisp. Drain off the fat. Add a splash of white wine and allow to evaporate. 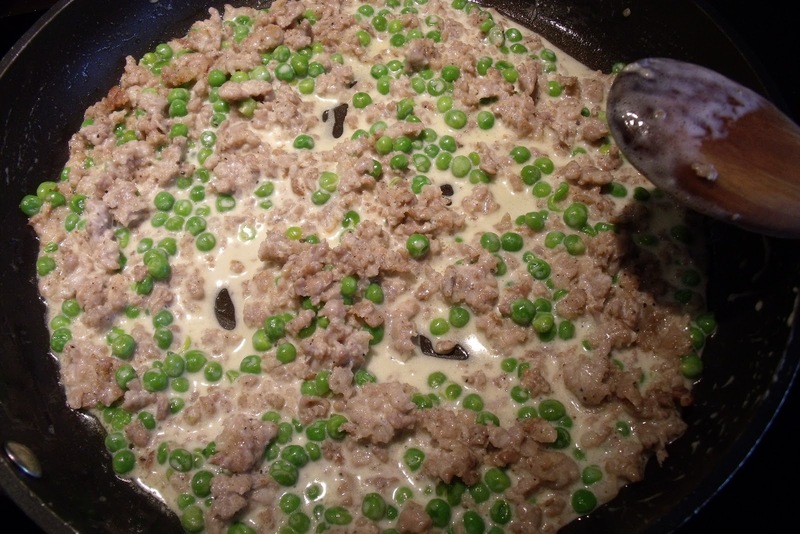 Add a tablespoon of extra virgin olive oil and the frozen peas, cover and let simmer while the pasta cooks. Cook the pasta in salted boiling water. Drain when "al dente". Add the pasta to the meat mix in the fry pan. Add about 1/2 cup of heavy cream and stir over medium heat until all of the pasta is covered with the sauce. Taste and add salt if necessary. I didn't add any, the sausage was seasoned enough! Serve with freshly grated parmigiano cheese and freshly ground pepper.